Ready to learn about the tenants of a great app, how to think about information architecture, best practices for designing flexible layouts, touch, how to leverage contracts, and much more? 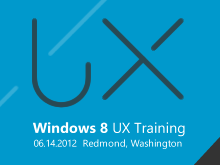 Join us for the video version of the full-day training event designed to give UX designers a solid understanding of how to design great Windows 8 apps that leverage the full capabilities of the platform and follow the UX guidelines. Windows 8 represents an unprecedented opportunity for UX designers and creative agencies as leading brands, businesses and app publishers around the world are beginning to re-imagine their experiences and differentiate themselves on Windows 8. The fastest way to get ready for Windows 8 is to learn about user experience and design from the team that built the platform.